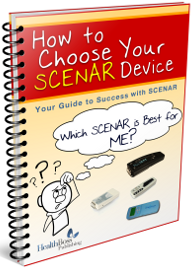 As you already know, SCENAR (SKENAR) is an acronym for Self-Controlled Energy Neuro-Adaptive Regulator (or Regulation), and it is the name given to both the technology as well as the family of devices. SCENAR (SKENAR) is holistic in nature and an energy-healing technology that aligns and strengthens the natural healing system of the human body. In doing this, it promotes a fast recovery from a wide variety of maladies – from simple colds and bruises to autoimmune diseases and degenerative disorders. 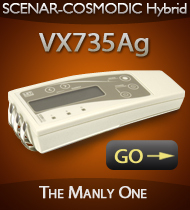 SCENAR (SKENAR) devices are low-frequency adaptive electrical stimulators and, in a sense, represent the “ideal electrotherapy”. 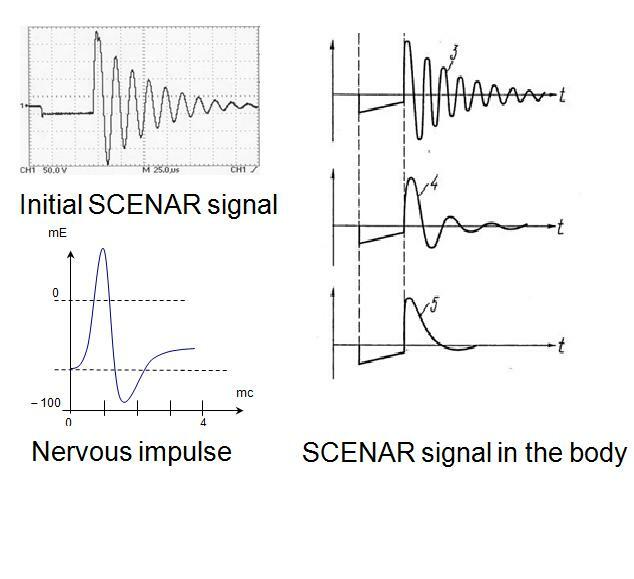 The first distinctive feature is the shape of the SCENAR (SKENAR) impulse that resembles the shape of natural neuro-impulses, the signals that our nerves use to communicate with each other and with the rest of the human body. Our body, therefore, recognizes SCENAR impulses as something familiar and enters into a dialog with the device. Initial SCENAR impulses at first glance look different from the nervous impulses. 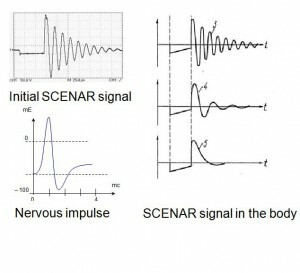 The tissue resistance, however, dampens the initial signal, which results in the modified waveform of the device impulse. 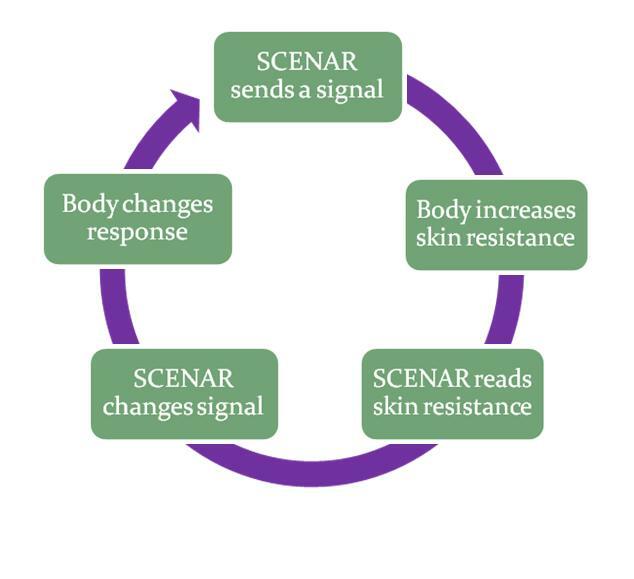 The second distinctive feature of SCENAR (SKENAR) is its ability to ‘read’ the body based on the body’s FEEDBACK and adjust its own activity to serve it in the best possible way. 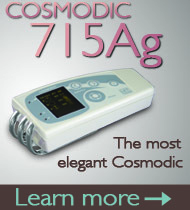 After receiving an initial signal from the device, the body responds in a protective manner by increasing the electrical resistance of the skin. This response (the body’s feedback) is then read by the device, which adjusts the signal and in turn, elicits another different response from the body, and so on. This way the body never gets used to ever-changing signals of the device. 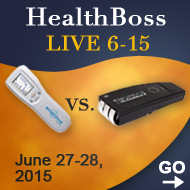 In this dialog, the body always leads – and the device follows. SCENAR (SKENAR) is an ‘adaptive’ stimulator because it adapts to the body’s needs, and not the other way round. SCENAR (SKENAR) is a good listener, and it listens to the language of biochemical reactions – the body’s true language. The outcome of this process is that the SCENAR (SKENAR) device gains an intimate knowledge of where and when the body needs help and for how long. The SCENAR (SKENAR) then provides the needed help by facilitating the release of massive amounts of healing chemical substances called neuropeptides or regulatory peptides from the body’s own internal pharmacy. After the body has what it needs, the healing happens fast in totality. SCENAR (SKENAR) technology was released in the Russian market in the late-80s, but wasn’t available in other countries until 1997. 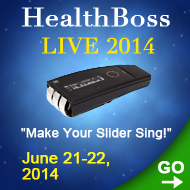 It has now been implemented in dozens of machines sold all over the world. We call these early devices ‘first-generation SCENARs’. Although they are very effective healing tools, they remain at the same level of technological development as the basic SCENAR of 1987, or ‘troika’. 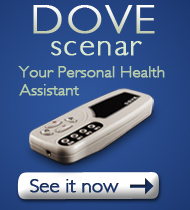 There is only one exception to this – The DOVE scenar. DOVE is also an acronym, which stands for the Device Organizing Vital Energy. The DOVE was designed by Dr. Alexander Karasev in 2005 as a “true SCENAR”, or as a “SCENAR as it should be”. 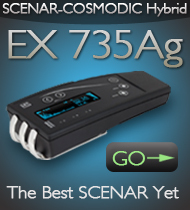 It is also the last embodiment of the SCENAR (SKENAR) technology that “the father of all SCENARs” designed. In The DOVE SCENAR he finally actualized the idea of a SCENAR (SKENAR) impulse being truly neuro-like at the moment of its contact with the nervous structures. This idea did not find its full implementation in the first-generation SCENARs due to the level of technological development in the end of the last century. Learn more about that simple home SCENAR model that often outperforms expensive professional SCENARs of the first generation HERE. The evolution of SCENAR (SKENAR) in the last few years has brought us a new development – COSMODIC ® technology, also a brainchild of Dr. Alexander Karasev and his main focus now days. We call COSMODIC ® devices ‘second-generation SCENARs’. COSMODIC ® devices are very different from the old SCENARs (SKENARs) in the look, in the healing effects, and in the treatment methodology. 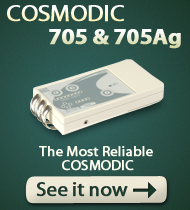 Learn more about COSMODIC ® HERE. Any results from injuries related to the spinal cord? Paralysis? Results with spinal cord injuries vary greatly. Everything depends on the particularities of the situation. Paralysis is not always an indication that nothing can be done, but if the spinal cord is completely severed even our wonderful healing technologies won’t help. If, however, there are still some residual functions, the injury is relatively fresh, and there is some positive dynamics in healing, SCENAR and COSMODIC can certainly substantially increase chances for further improvement. quedo en espera de noticias, gracias.